The Earth is doomed, as you already know. The National Oceanic and Atmospheric Administration, NASA, and the Japan Meteorological Agency found this June to be the Earth’s warmest on record, which seems small in comparison to the fact that they’re predicting this year to be the warmest year to date. 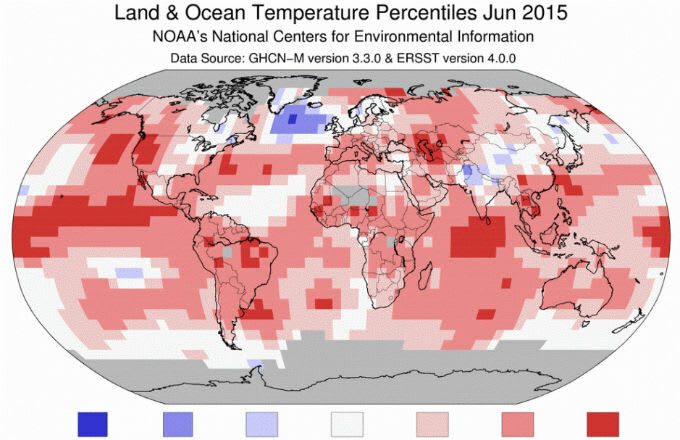 Part of a larger pattern, June, according to Mashable, was the third month of 2015 to break monthly temperature records. Average temperatures worldwide surpassed the 20th-century average by a full 2.27 degrees Farenheit. And although El Niño—the weather phenomenon causing warm ocean temperatures— has contributed to this year’s record-breaking temperatures, it isn’t all to blame according to head of climate monitoring at NOAA’s National Centers for Environmental Information, Deke Arnt. He told Mashable, “Climate change is a long-term driver.” Adding, “They play together to produce outcomes like what is likely to be the warmest year on record." "We conclude that continued high emissions will make multi-meter sea level rise practically unavoidable and likely to occur this century. Social disruption and economic consequences of such large sea level rise could be devastating. It is not difficult to imagine that conflicts arising from forced migrations and economic collapse might make the planet ungovernable, threatening the fabric of civilization." Still don’t get the picture? Business Insider’s handy video on rising sea levels should do the trick. If all of the Earth’s were to completely melt, sea levels would rise 260 feet completely drowning Florida and major U.S. cities like San Francisco, New Orleans, not to mention the eastern seaboard: D.C., Philadelphia, New York, Boston.